Traveling is one of my favorite things to do. I love going to new places, seeing the sights, learning about the history and culture, and sampling the food. Bringing back souvenirs is also something I look forward to when traveling. I started collecting artwork as souvenirs when I was in Florence, Italy in 2005. One of the wonderful things about Florence is the amazingly talented street artists. 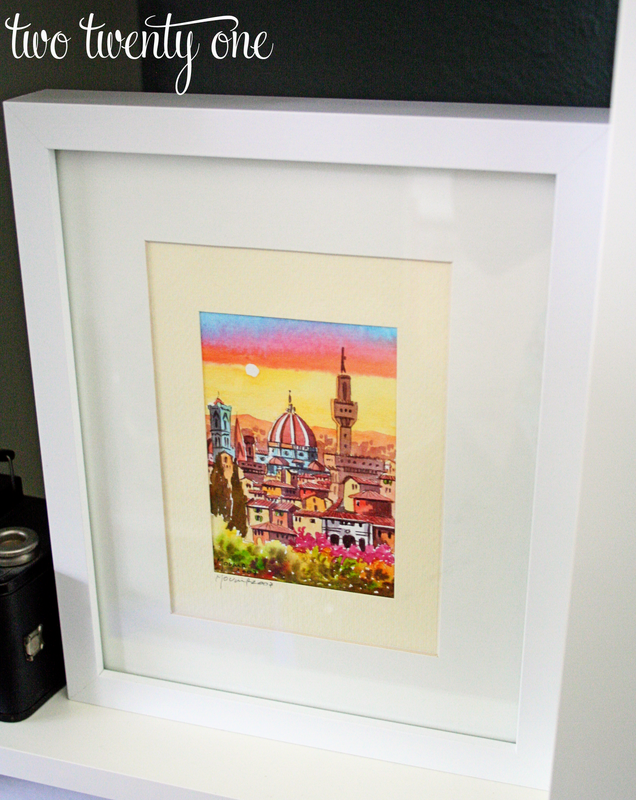 I purchased this water color of the Florence skyline from a street artist outside the Museo de Uffizi. 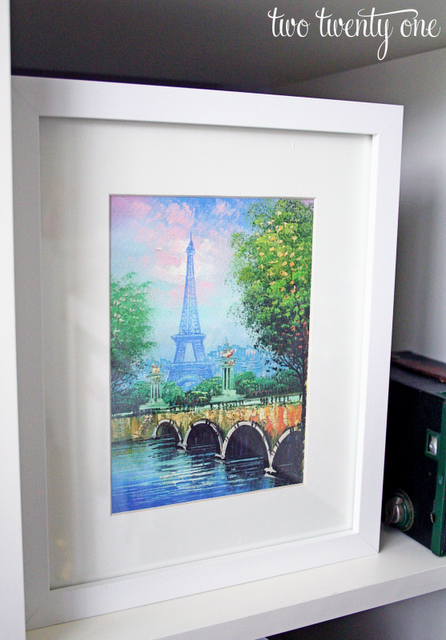 I picked up a handful of watercolor reprints while in Paris. Here’s one that I framed and display in my home office. The tradition of picking up local art continued when we went on a Caribbean cruise in 2008. 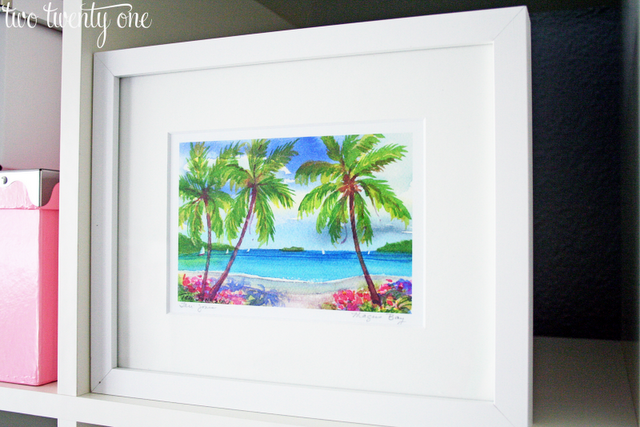 This is a watercolor reprint of Magens Bay in St. Thomas. I don’t collect many things, but I do hoard collect pashminas and scarves. 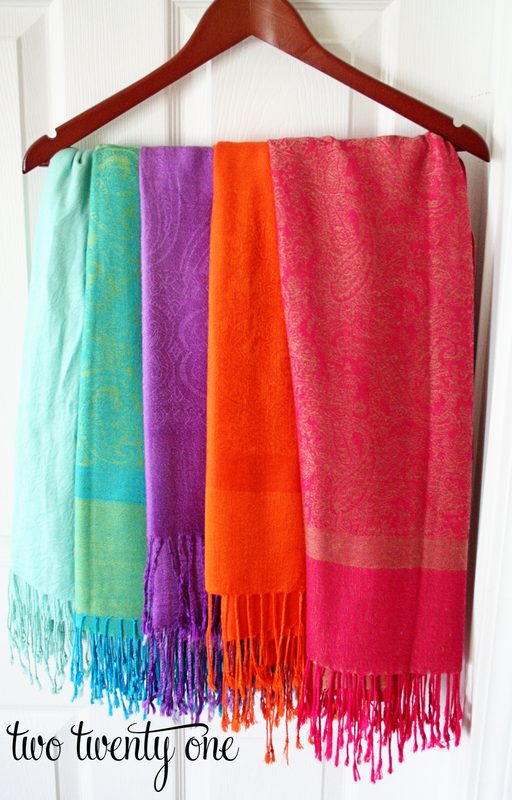 Whenever we go on vacation I look for a pashmina or scarf to bring back. These pashminas are from the Alaskan and Caribbean cruises we went on. 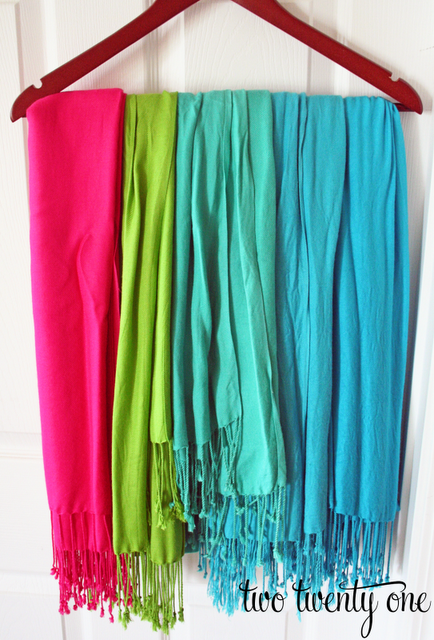 The pashmina on the left is from Ireland. The other ones are from Italy. I’d be lying if I said I didn’t enjoy haggling with the street vendors in Italy. I brought back pashminas for my female friends and family members because they were inexpensive, and they didn’t take up too much room in my luggage. 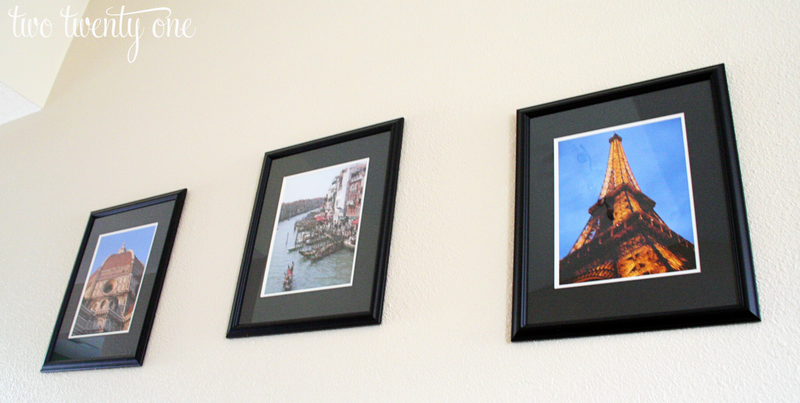 I love to enlarge, matte, and frame photos I take on vacation. These 16×20 photos that I took of the Duomo de Firenze, a canal in Venice, and the Eiffel Tower hang in our great room. In case you haven’t caught on, I like to save things. Some call it hoarding, some call it saving. I say saving. One of the things I like to save from vacations are my ticket stubs. 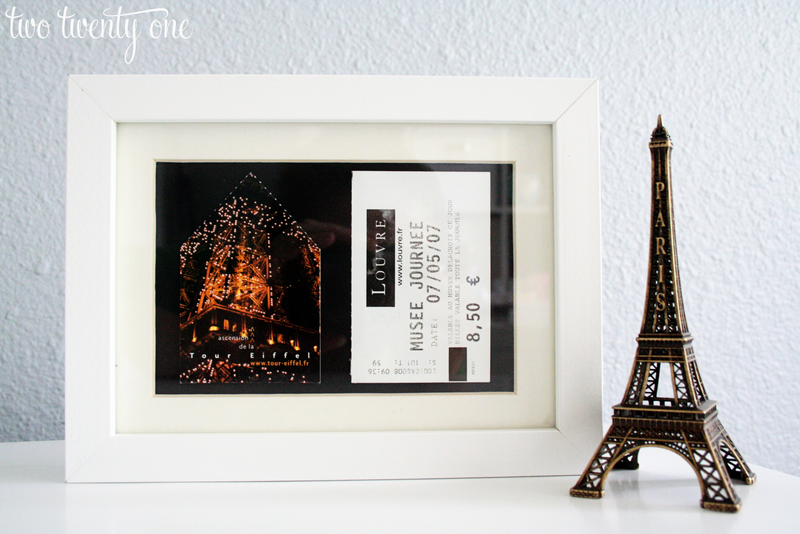 I framed my ticket stubs from the Eiffel Tower and The Louvre. And who goes to Paris without picking up a miniature Eiffel Tower? No one, that’s who. I lived in Ireland for 10 weeks my senior year of college. Coming home with a bag full of Cadbury chocolate was a no brainer. But I thought it would be wise to bring home some non-edible souvenirs as well. 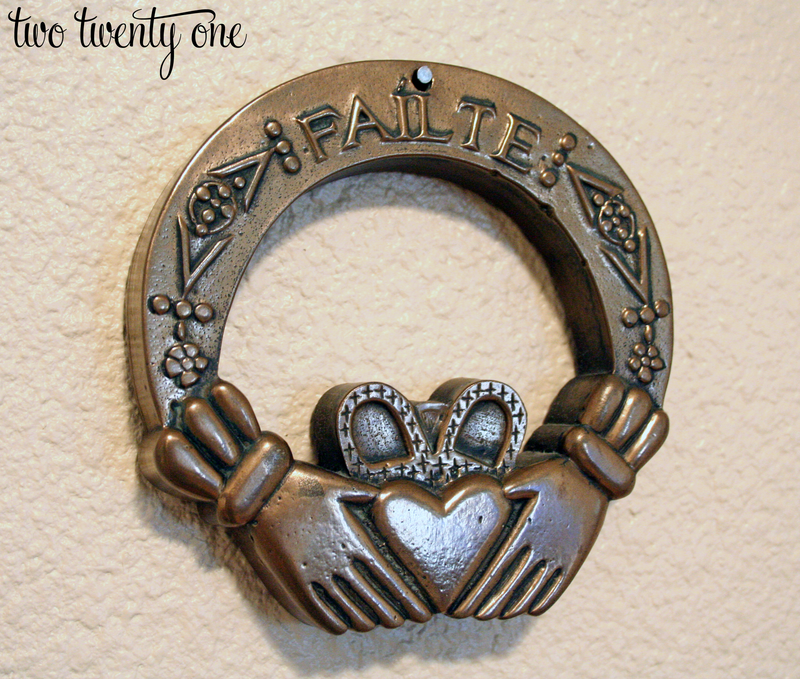 The claddagh that reads “Fáilte”, which means “welcome”, hangs beside our front door. 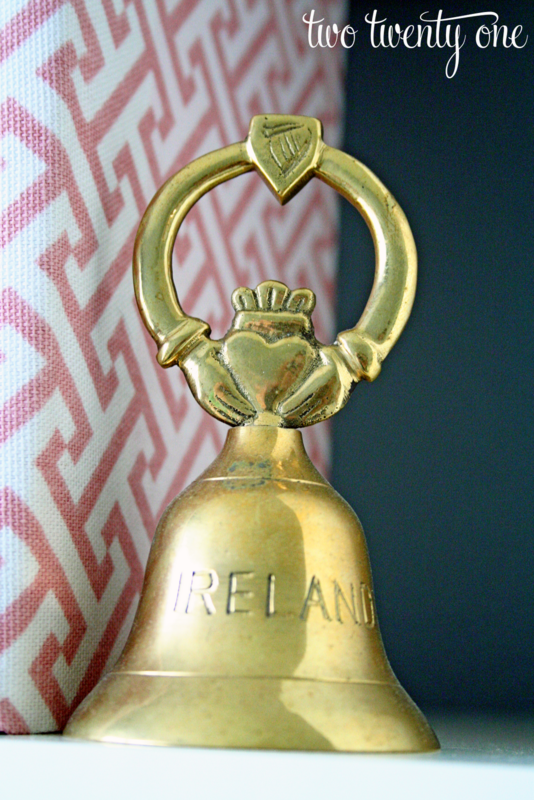 I also brought back a bell with a calddagh on top. When I’m sick, I ring it to beckon Brad. 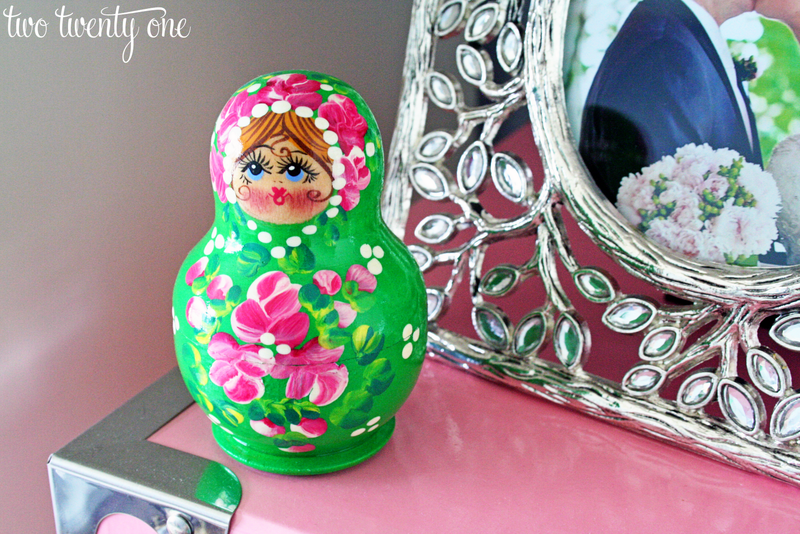 I love my cute little Russian nesting doll that I got in Sitka, Alaska. What are your favorite souvenirs? What was your favorite vacation destination? I’m linking up with Centsational Girl. I love this post! I got a mini eiffel tower in Paris too! I gave it to my boyfriend/now husband. I don’t think we have it anymore, but I really wish that I had gotten some watercolors..I only have one from our honeymoon in Gatlinburg. I never even thought to blow up and frame any of the pictures I took. I will have to see if I have any good ones and get on the ball!! Where did you get your white frames? I love them! What beautiful souvenirs! I love the ticket Louvre ticket stub in that frame. I loved the Louvre (despite the crazy tourists). You are so smart to collect things on your trips. I love the paintings!! I love your artwork collections. I also picked up a few pashminas in Venice. ha ha! I love it. I totally have a tiny eiffel tower( from a teenage Paris excursion), and I have all sorts of ticket stubs etc, that I need to go about framing now that I’ve stumbled upon this cute pic!! Great post today!!! Were the Russian dolls on IG? I think the Paris vingette was my fave. Two thumbs up, chica! I can’t wait to do more travel internationally, but we vowed to see some of our favorite US cities before we travel abroad again!! We always buy a deck of cards. We have a drawer full. I love the idea of buying artwork to display though, I might have to take up that as my souvernir shopping now!!! Love those watercolors and the scarves!! I used to be more into souvenirs but then I got tired of random stuff around my house. Non-hoarder here. I do, however, have a tiny Eiffel tower! LOVE! my mother in law brought me back a pashmina from Paris – I will never part with it! Beautiful travel souvenirs! Fantastic post!